Black Fairy is a fairy tale, but not in the traditional sense. When writing this play, i did not want to re-create the types of fantasies which are so common in Childrens theater. There is no kind of magic that can relieve black children from the oppression that retards their development. However, i do feel giving them a better understanding of their heritage can help them achieve their true potential. And those of us who are concerned with their development should try to expose them to knowledge that gives them a positive sense of identity. Although i do feel a chldren's play should be entertaining, I also feel it should be educational. Also, because there are so few children's plays which reflect the black experience, I wanted to write a play that Black children could identify with. "Black Fairy" is a musical drama about a black fairy who lacks pride in herself and feels she has to offer Black children. But when she meets Black Bird and Queen Mother (Who take her to ancient Egypt, East Afrika, a southern slave plantation and the streets of Harlem) she begins toget a better understanding of her heritage. Her journey through the past enables Black Fairy to meet Aesop, Brer Rabbit, Brer Fox, Uncle Remus, Stag-o-lee, Leadbelly and many other characters in Black folklore and Black history. At the end of her journey, Black fairy realizes that "Being Black is nothing to be ashamed of" and is then able to share her knowledge with other Black children. Even though Black Fairy doesn't completely resolve her dilemma, having a knowledge of her heritage does give her more confidence to cope with the future. It is only fair to mention that "Black Fairy" would never have come to life if it were not for the creative directorsip of Pemon Rami and the music composed by Tony Llorens and Jerry Johnson. These people, more than anyone else, have made Black fairy the success it has become. I also feel that without the full support of Better Boys Foundation and its Board of Directors, The production and this album would not have been possible. 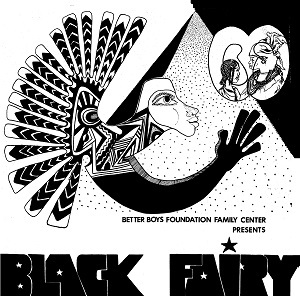 "Black Fairy" was the second play at the Lamont Zeno Community Theater, a cltural program of the Better Boys Foundationm a family agency located in North Lawndale in Chicago. Many of the yougsters who perform in the play are members of our Youth Theater Developmen Program which is partially funded by the National Endowment For The Arts. Under the capable guidance of Pemon Rami and his staff, we were able to take youngsters who had no previous theater experience and train them to become competent performers and also teach themother technical theater skills. The result of this effort has mad "Black Fairy" a favorite among both children and adults who have had an opportunity to see it. During ther summer of 1974 "Black Fairy" was performed for over four thousand children in Chicago. And, in April of 1975, it played to over two thousand children in Detroit at Mercy College. "Black Fairy" is the only the first of many children's plays we hope to produce at the Better Boys Foundation. There is an Afrikan proverb which says:"Children are the reward of life". We at Better Boys Foundationm are dedicated to this belief, and feel that helping childrren to appreciate their heritage is one means of showing our concern for their development.